Be the first to share your favorite memory, photo or story of Rhonda. This memorial page is dedicated for family, friends and future generations to celebrate the life of their loved one. 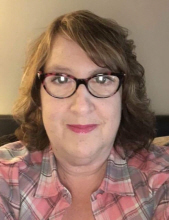 Rhonda Rae Brown, age 49 of Windsor passed away at 6:30 p.m. on Thursday, November 8, 2018 at HSHS Good Shepherd Hospital in Shelbyville. Funeral Services honoring her life will begin at 7:00 p.m. on Wednesday, November 14, 2018 at Schilling Funeral Home. Burial will take place at a later date. Visitation for family and friends will be held from 5:00 p.m. until the time of the service on Wednesday at the funeral home. Rhonda was born on June 10, 1969 in Joliet, IL the daughter of Ronald and Glenda (Jordan) Boyer. She married Russell Brown on May 11, 1996. Survivors include her loving husband, Russell Brown; sons, Stephen Brown and Mason Brown; sister, Dawn (Mike) Hayes; and several nieces and nephews. Rhonda was preceded in death by her parents. Rhonda was an amazing wife, mother, sister, and friend. She never knew a stranger and had a smile for everyone she met. She worked as a CNA for 30 years at long-term care facilities in Coles and Moultrie caring for others. She loved her work and caring for others. She loved her family and friends. Rhonda’s most cherished were her husband and two sons. She loved life, laughing and having fun in everything she did. Rhonda’s hobbies included listening to music, watching her favorite television shows, and shopping. Her best times were spent with her family and many friends. Rhonda always tried to stay positive and had a great outlook on life. To know Rhonda was to love her… If you were her friend, you were family. Memorial donations in her honor are suggested to the family to assist with funeral expenses. To send flowers or a remembrance gift to the family of Rhonda R. Brown, please visit our Tribute Store. Or, if you would like to donate to the family, please visit Rhonda's Tribute Fund. Help ease the financial burden placed on the Brown Family after the loss of a loved one by making a donation. The family would like to express their sincerest gratitude for your financial contribution and support during this difficult time. Add a personal message that will be shared to the tribute wall. "Email Address" would like to share the life celebration of Rhonda R. Brown. Click on the "link" to go to share a favorite memory or leave a condolence message for the family. Provide comfort by sending fresh flowers from our local florist or donating to Rhonda's Tribute Fund.